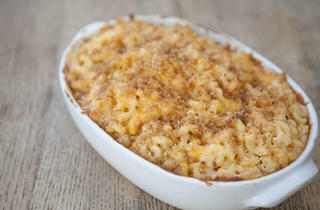 The best Thanksgiving side dishes, including mac 'n cheese, stuffing, cranberry sauce, sweet potatoes, brussels sprouts, biscuits and gravy. Thanksgiving in Los Angeles is an all-star cast: from the centerpiece turkey, to the save-the-best-for-last pies and copious amounts of vino. But Thanksgiving wouldn't be the once-a-year feast without the supporting cast of T-day side dishes and fixings like stuffing, gravy, cranberry sauce, sweet potatoes, brussels sprouts and biscuits. 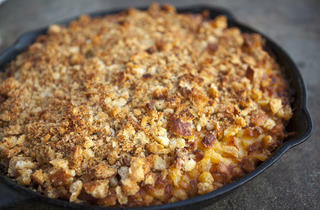 Whether you're looking for a classsic version or a spin on the traditional, here are Thanksgiving's best side dishes. Suzanne Goin recreates mom's traditional version with the cafe/bakery's sublime bread mixed and baked with fennel, celery, herbs and chicken stock. Pastry seekers who file into Christine Moore's Pasadena cafe/bakery every morning can take out Thanksgiving day garlic parsley rolls, perhaps with some honey butter to top. 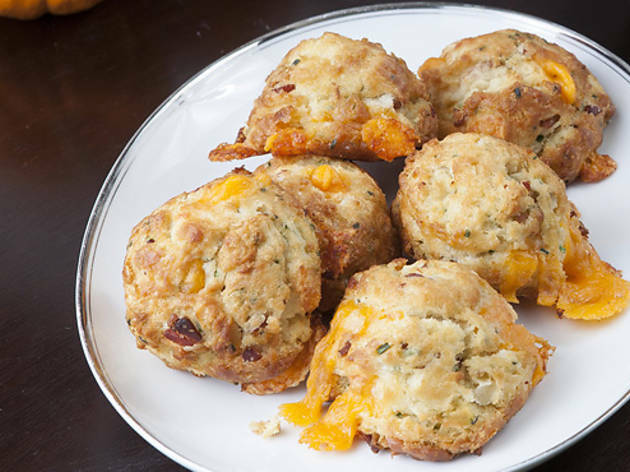 David LeFevre's rustic American eatery updates the biscuit with bacon, Cheddar and chives for a hearty, pre-meal bite. 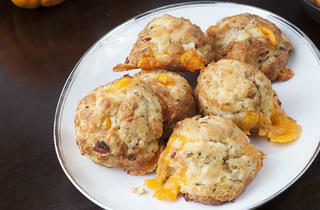 Top with maple butter and it's sweet and savory satisfaction. 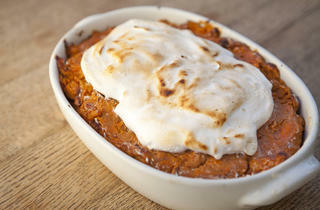 As classic as it gets, Clementine's version satisfies the traditionalist with sweet and tart sauce served by the pint. 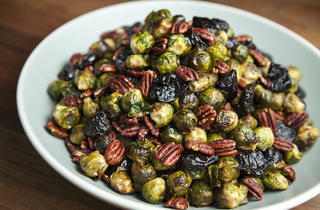 Los Feliz's Italian eatery offers brussels sprouts roasted with wild boar bacon for a rustic, old-world side. 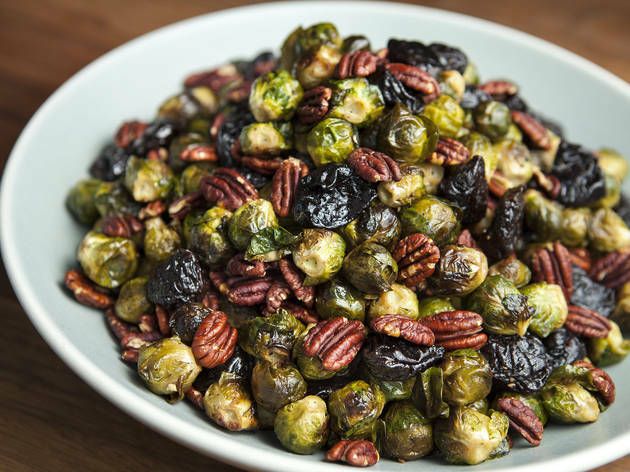 You'll have no problem polishing off these sprouts that are roasted and mixed with dried figs and walnuts. 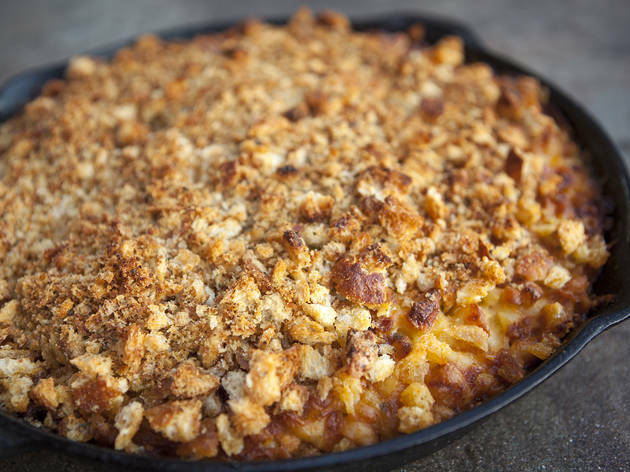 The classic mac 'n cheese—macaroni mixed with Cheddar (and cream cheese for extra tang) and topped with homemade breadcrumbs—is one of best we've ever tried that takes us back to childhood. 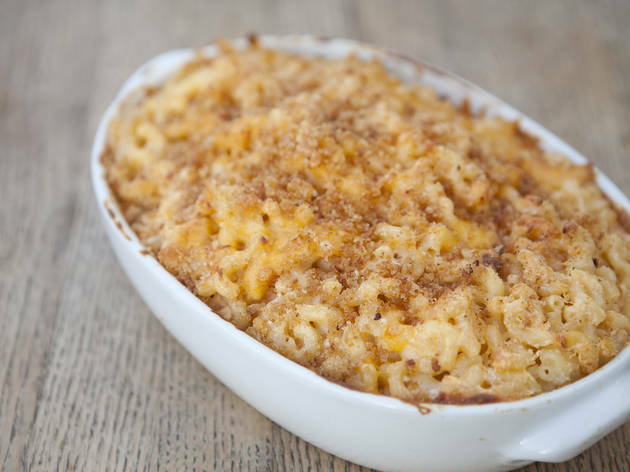 This gooey baked goodness is baked with eight different types of cheese and topped with breadcrumbs using the deli's coveted bread. 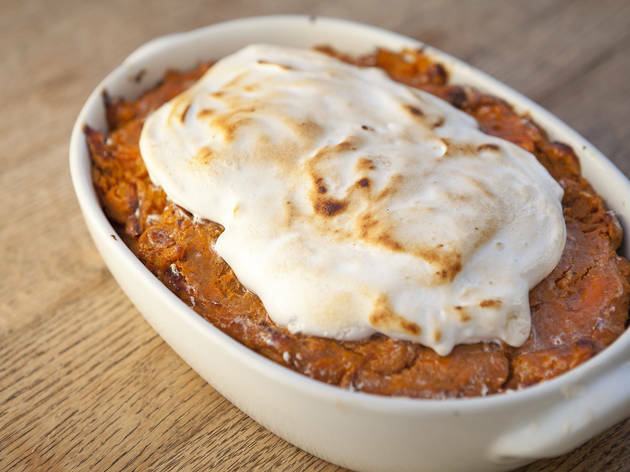 Sweet potatoes are spiced with cinnamon and ginger and topped with fluff (homemade, of course) for a baked casserole just like Mom's. This classic Southern version starts with whipped sweet potatoes (sweet butter, cream) that are topped with brown sugar streusel made with housemade salty, sweet candied pecans. 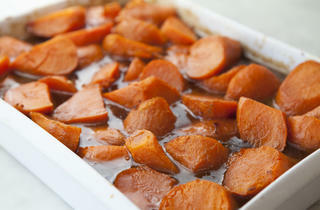 Why merely top yams with sugar and butter when they can bath in them? 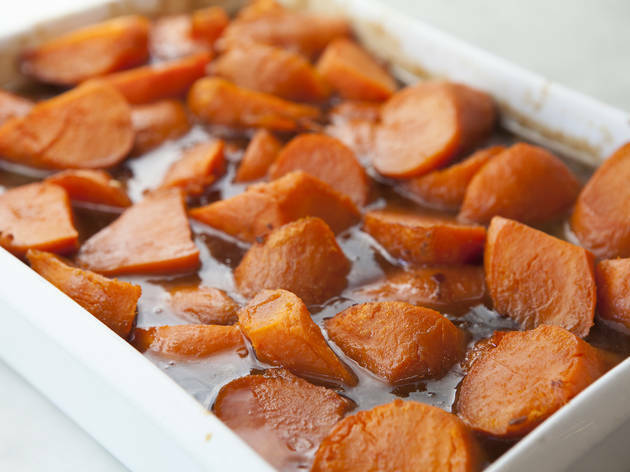 Chunky cuts of yams bake in liquid goodness for a non-pureed version of candied yams. Mom-made, Campbell's soup variety green bean casserole was never good, but Culver City's Akasha prepares the haricots verts with mushrooms and a crunchy, fried onion topping. Thomas Keller's French bistro gussies up the old-school classic with bite-sized green beans comined with a mushroom velouté (fancy for thickened French sauce) and topped with fried shallots. 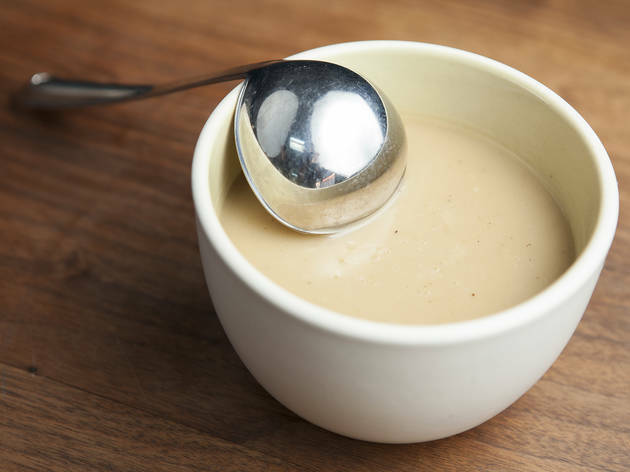 Daniel Mattern makes this traditional gravy with housemade turkey stock, giblets and pan drippings (aka the good stuff). Chicken stock starts with roasted turkey bones, then thickened with butter and flour. 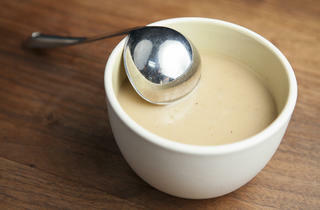 The secret: turkey giblets that have been sous-vided in duck fat overnight amp up this ultimate gravy.